The Junior Breakfast marks juniors’ transition to the role of senior leadership and provides an opportunity for parents to mark the occasion with a class ring or other gift. This year’s speaker was KCD grad Jason Geer ’11, who encouraged students to make the most of their KCD experience by opening themselves to new activities and experiences. 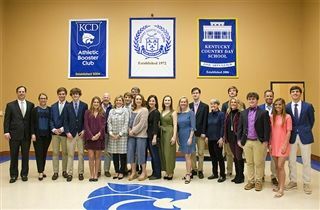 Kentucky Country Day School is a private JK–12, coeducational school located on a spacious 85-acre campus in Louisville, KY. KCD combines a rigorous academic program with a wide variety of athletic and extracurricular programs. Our outstanding faculty creates an intimate learning environment that is both challenging and supportive.